Cut-Off Gates | Honeyville Metal, Inc.
Full and Half Cut-Off Gates are available to install in your piping to reduce or control the amount of air you are pulling from a designated area. 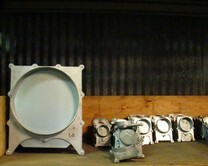 These cut-offs are available with a manual hand slide or with an air cylinder. Full cut-offs are available from 2" up to 24" diameter and the half cut-offs from 3" up to 18" diameter.